Mix brown sugar, shortening, butter, vanilla and egg yolk in medium bowl. Stir in flour and salt until dough holds together. Shape dough into 1-inch balls. Beat egg white slightly. Dip each ball into egg white. Roll in nuts. Place about 1 inch apart on ungreased cookie sheet. Press thumb deeply in center of each. Bake about 10 minutes or until light brown. Immediately remove from cookie sheet to wire rack. Cool completely, about 30 minutes. Fill thumbprints with jelly. These cookies were often called Thimble Cookies in older cookbooks because bakers used a thimble to make the indentation. You'll be done in a flash if you use a food processor to chop the nuts. Classic thumbprint cookies are a festive addition to holiday cookie trays. This shortbread-style cookie is incredibly easy to make. Cookie dough gets rolled into balls and then dipped in finely chopped nuts. If the dough is too soft to roll, refrigerate it for a few minutes before handling. For an even bake, make sure each dough ball is the same size and shape and spaced evenly on the baking sheet. 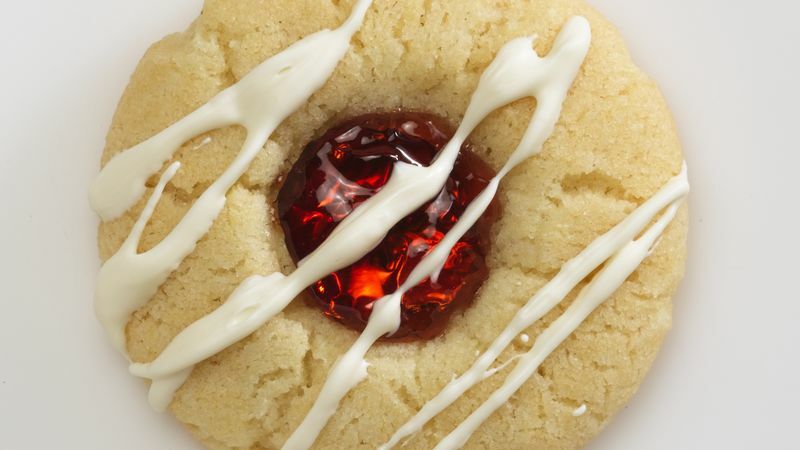 When adding your thumbprint to each one, make sure to create a deep indentation, so you’ll have a nice spot to spoon the jelly after the cookies come out of the oven. Classic thumbprint cookies add a touch of personalization to your holiday cookie tray. If you want more cookie ideas to make your own, check out Betty’s cookie cheat sheet and don’t forget about the rest of her thumbprint cookie recipes.